The one scenario I dislike playing more than any other is "Dominate". This is not because of the premise of concentration of force in the centre but because it is difficult to know at a glance the state of the game. The Rules Committee have helped in making the Victory Conditions based on Unit Strength. This stops the need for calculators out Turns 5-7. However I have always disliked the trigonometry introduced by a circle. When you are trying to determine whether something is in or out a tape measure and arcs aren't your friend. Earlier in the year I suggested switching from circle to box but the general consensus was that I was proposing a solution for something that wasn't a problem. Recently I watched the YouTube battle Report for Dominate, that the Giant Dwarf Podcast posted. 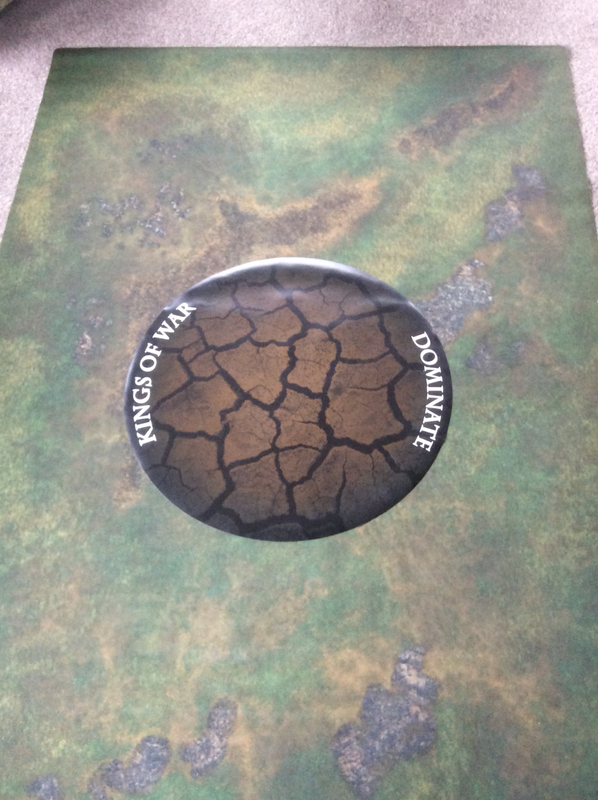 The game between Undead vs. Dwarfs was good but what really interested me was the Dominate zone marker that Fred and Lars had on their table. This solved all my problems. Absolutely no ambiguity - you can see the game situation at a glance. No opportunity for misunderstandings, incorrect measurement or central counter being knocked. I knew from the first episode of their podcast that they had had a few of these made at a copy shop. The 2 foot circle is made of vinyl and sits on top of your table. I had thought of doing this myself previously but had never got around to it. I contacted Fred to see if he had one spare that I could purchase (or failing that a copy of the file). Thankfully I was lucky and got the last one. Thanks very much Fred and Lars. First, Norway gives us the Longship and the ginger gene, now they give us the Dominate Circle. I prefer your square suggestion Pete. We go to a lot of trouble to put decent looking terrain on the table and this just detracts from it. It bears no relation to the terrain on the table. A clear vinyl or plastic one might look OK.
My idea was to make a wire circle which I hoped would have minimum visual impact but still define the area for the mission. Using the example of Warmahordes Steamroller Zone templates, which have been around for a long time, there are great possibilities for this sort of thing printed on vinyl or neoprene to suit/match army or terrain themes.